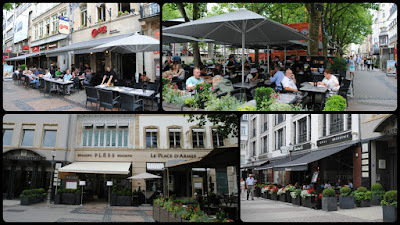 We had eaten lunch before leaving for our city tour of Luxembourg and dinner would be waiting for us when we return to the ship, but if you didn't want to wait, there are plenty of dining options in city center. From French Brasseries and Pâtisseries to local or international food chains, there is something for everyone. 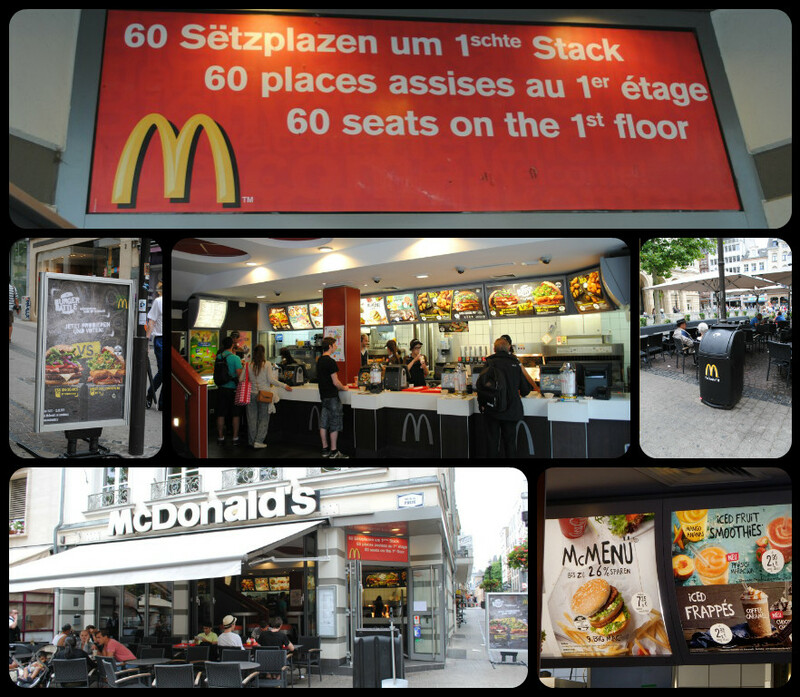 "You Deserve a Break Today ..."
Traveling the world we've found the Golden Arches all over and that includes Luxembourg. Here you'll find your hometown favorites as well as a local twist on the menu. As you can see from the sign, there's plenty of seating inside or you can eat outside in the center of the plaza. There are 9 McDonald's as of this writing. 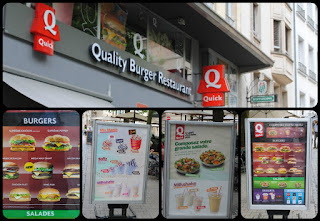 If you are looking for a fast food alternative to McDonald's, give Quick Restaurant a try while in Luxembourg. We can't provide personal experience, and since food likes are subjective, you'll need to make your own decision on whether or not it was quality or simply fast food. 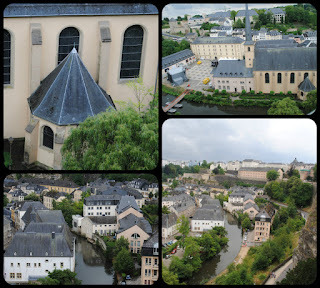 Luxembourg is one of those cities where we didn't have enough time to really try or see it all. 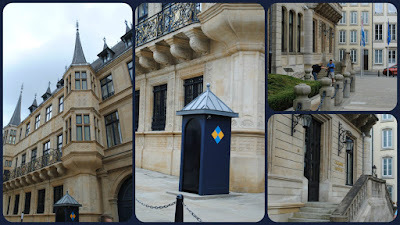 The Grand Ducal Palace is a palace in Luxembourg City. It is the official residence of the Grand Duke of Luxembourg, and where he performs most of his duties as head of state of the Grand Duchy. There were no guards present which means the Grand Duke was not in residence when we were there. After walking around for awhile, several passengers were looking for a water closet. Our guide directed us to the Chocolate House which had a WC downstairs. The stairs were very narrow and had enough room for only one person at a time. The most prominent attractions include the "casemates" or bunkers, which are among the longest subterranean tunnels in the world. 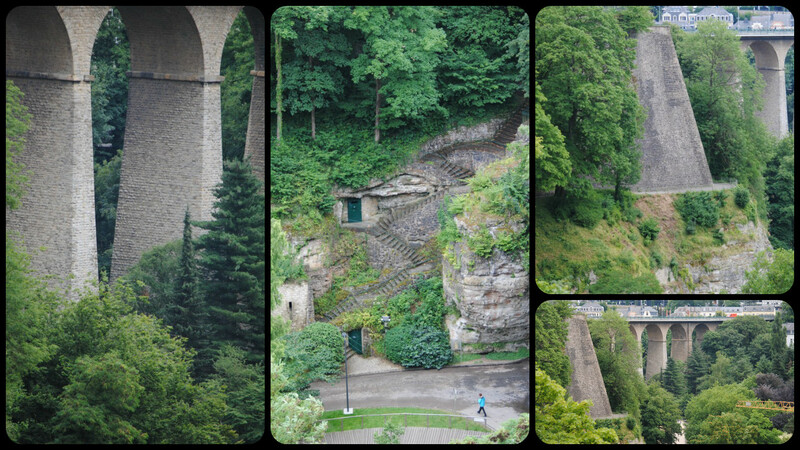 The casemates that once formed an extraordinary network of 23 km were carved into the rocks of the city and are a top attraction in Luxembourg City. Not only did they provide shelter for thousands of defenders with their equipment and horses, but they were also home to workshops of artillery and armaments, kitchens, bakeries, slaughterhouses, etc. 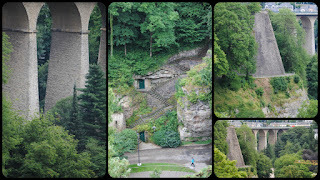 Also called “the most beautiful balcony of Europe” (according to the Luxembourg writer Batty Weber), it runs along the Alzette valley on the ramparts - built by the Spaniards and the French in the 17th century - from the Bock Promontory up to the lower part of the Holy Ghost Citadel, the so-called “Rondellen”. Up to the year 1870 the Corniche had staircases in steep parts which were leveled off only after the dismantling of the fortress. 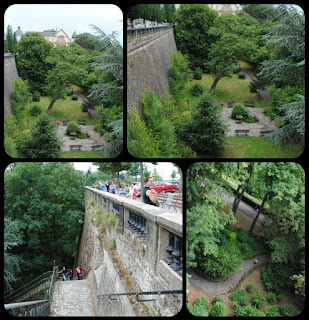 Moreover the greatest part of the protecting wall with its loopholes was cleared away so as to disclose a superb panorama on the valley of the Alzette, the city district of Grund and the Rham Plateau. 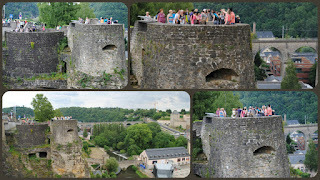 The Old bridge – in common parlance – was built between 1859 and 1861 to cross the Pétrusse valley at a height of 45 metres. It consists of 24 arches spanning either 8 or 15 m The total length is 290 metres whereas the slight curve in the middle is the result of military and strategic considerations. etres and of pillars up to 30 metres high. The crypt of the Cathedral contains the remains of members of the Grand-Ducal family. 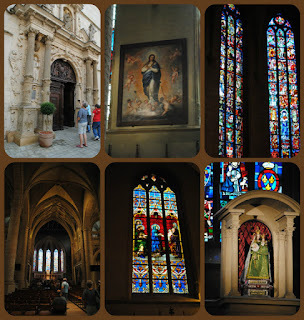 In particular, John of Bohemia (1296–1346), Marie-Adélaïde (1894–1924), Marie Anne of Portugal (1861–1942), Felix of Bourbon-Parma (1893–1970), Charlotte (1896–1985), and Joséphine Charlotte of Belgium (1927–2005) are buried in the crypt. Following lunch, we boarded a motor coach for our optional tour to the capital of Luxembourg. 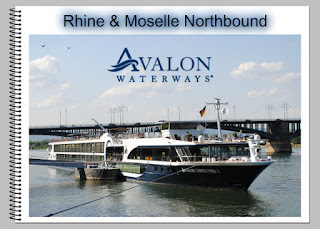 The scenic ride took about 45 minutes from our ship's docking location in Grevenmacher. 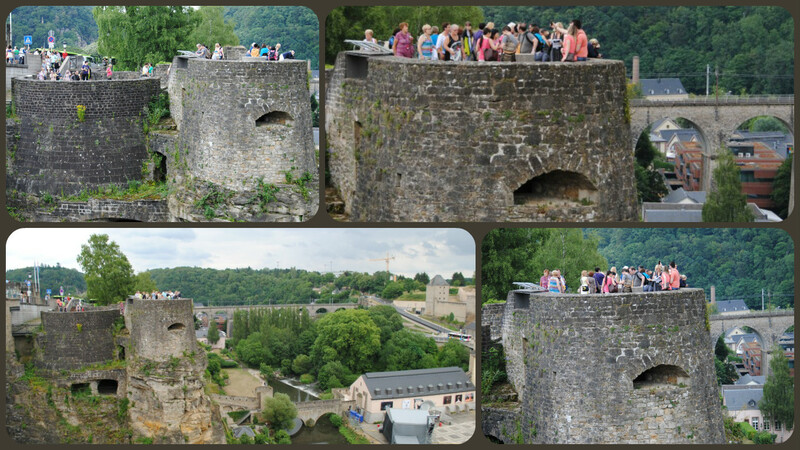 Because of its location and natural geography, Luxembourg City has, throughout history, been a place of strategic military significance, the first fortifications having been built as early as the 10th century. The city center occupies a picturesque site, perched high on precipitous cliffs that drop into the narrow valleys of the Alzette and Pétrusse rivers. A local guide acquainted us with the city, whose layout is complex as it is set on two levels, straddling hills and dropping into the two river valleys. 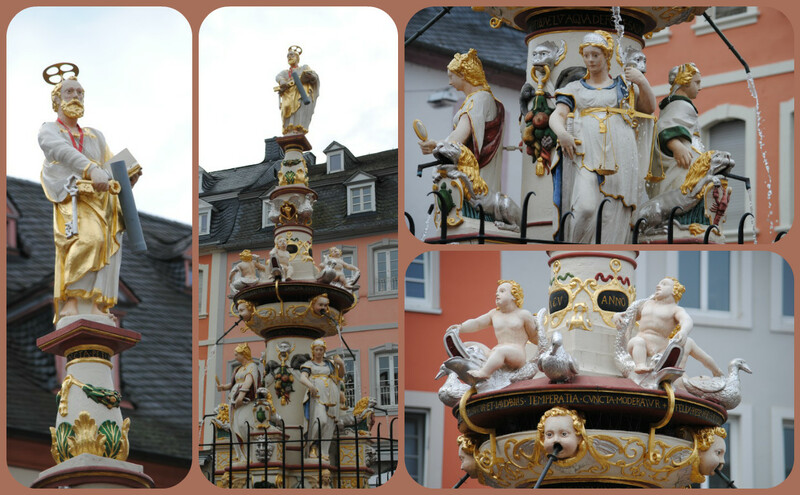 Earlier there had been some rain, evident by the wet sidewalks and streets, but it was lovely while we were there. 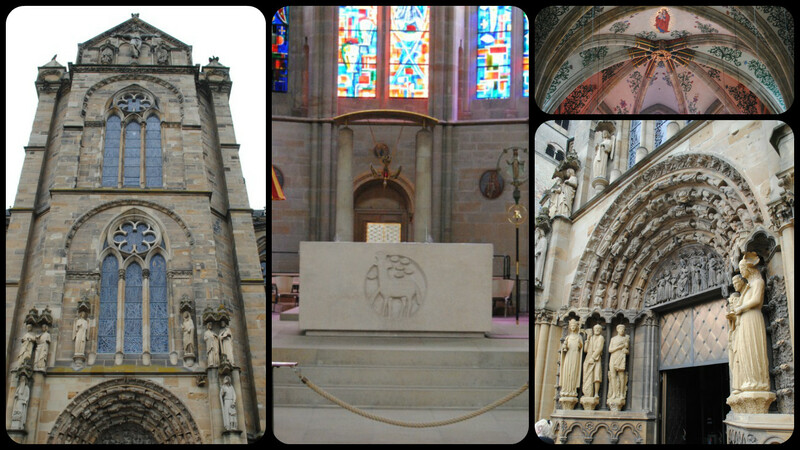 Our tour began at The Monument of Remembrance, usually known by the nickname of the Gëlle Fra ('Golden Lady'). 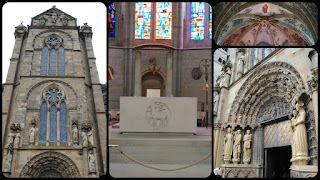 This war memorial in Luxembourg City, in southern Luxembourg, is dedicated to the thousands of Luxembourgers who volunteered for service in the armed forces of the Allied Powers during World War I. Located on William Square, it was built between 1830 and 1838 in neo-classical style. The stones of the old Franciscan monastery, dismantled in 1829, mainly went into its construction. 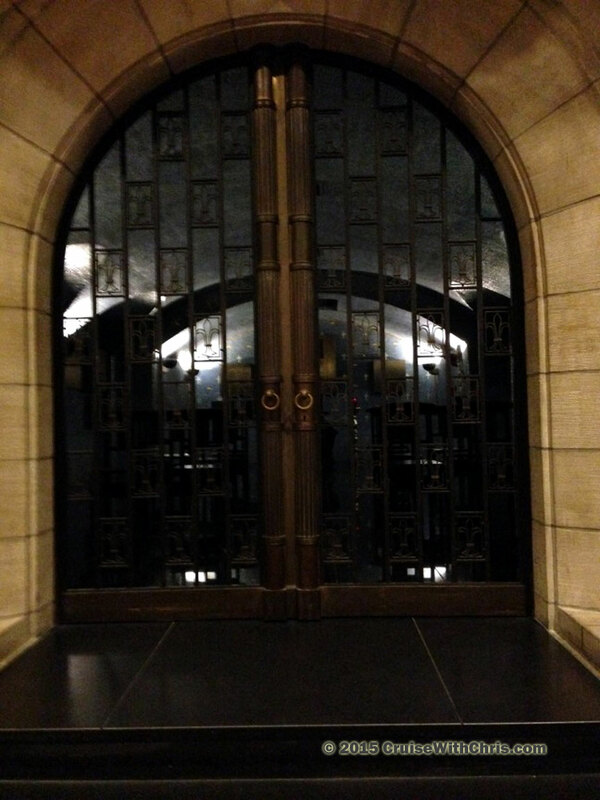 In 1931 two bronze lions were added to flank both sides of the outdoor stairs. 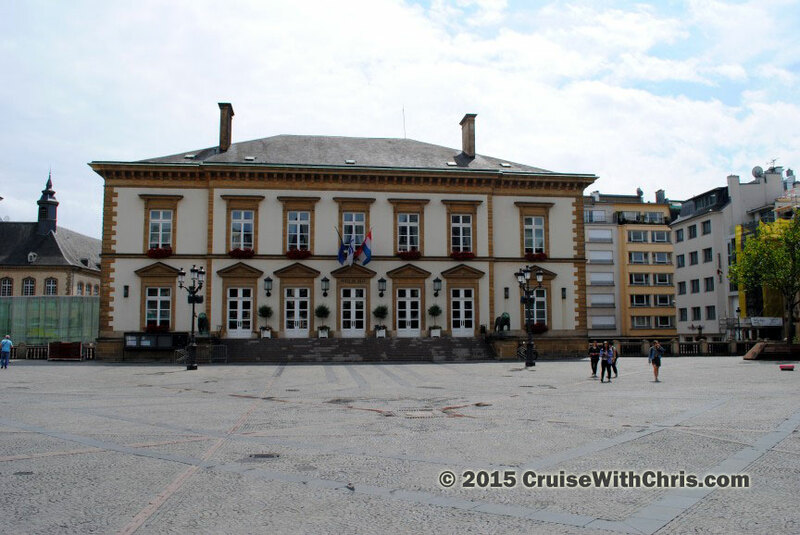 The edifice is the seat of the city administration and houses the plenary hall of the municipal council. 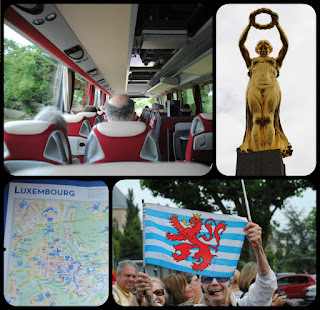 A little bit further you will find the Luxembourg City Tourist Office. This bronze statue was set up on William Square to pay tribute to the King and Grand Duke William II of Nassau-Orange. 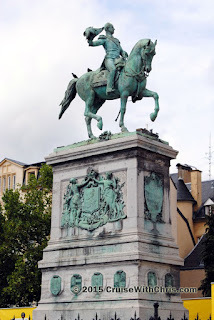 He ruled from 1840 to 1849 and, one year before his death, granted the Grand Duchy its first parliamentary constitution, one of the most liberal in Europe at the time. The riding figure of William II is the work of the French sculptor Antonin Mercié; the statue of the horse is by Victor Peter. 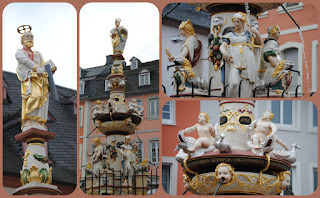 The pedestal of the monument reveals the coat of arms of the House of Orange-Nassau and of Luxembourg and the ones of the 12 cantons of Luxembourg. From William Square, we walked to the Notre-Dame Cathedral which we will cover in a separate post. A great getaway relieves stress and brings people together. It can also give us a chance to learn about new cultures, visit historic places, taste exciting foods, and experience new things. 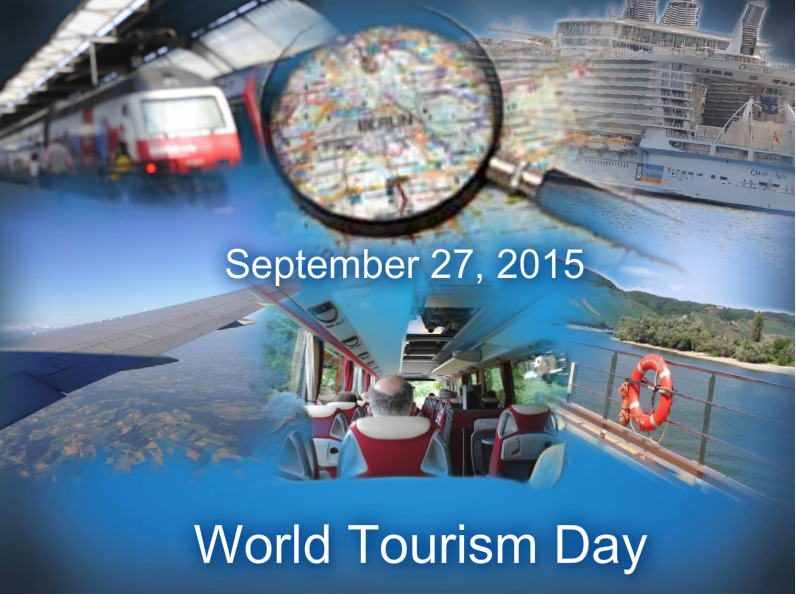 Let us help you see the world. 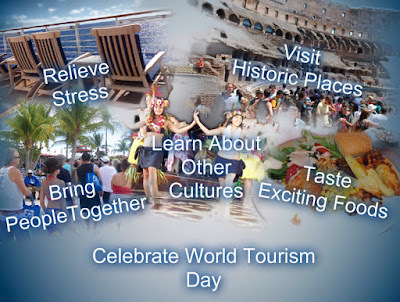 "Let us work together to maximize the immense potential of tourism to drive inclusive economic growth, protect the environment and promote sustainable development and a life of dignity for all." 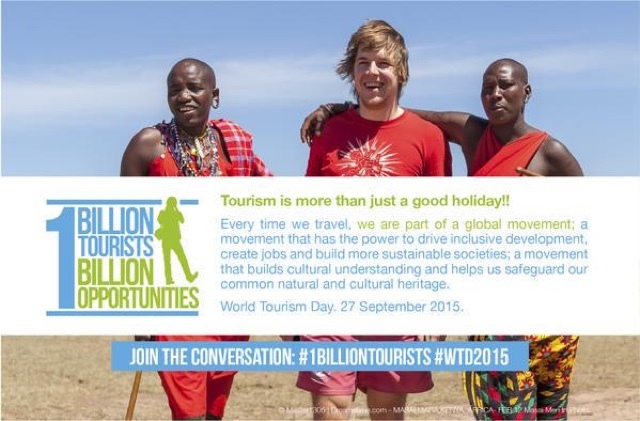 Earlier this year, the leading global Travel & Tourism private sector and government organisations - the Global Travel Association Coalition (GTAC) - launched a commitment for aligned advocacy and action to harness the full potential of the sector to create jobs, drive inclusive growth and foster development. “Powering Travel & Tourism into the Next Decade: An Agenda for Growth and Development” was launched at a press conference in Madrid on the behalf of the GTAC by three of the founding members: Tony Tyler. Director General and CEO of the International Air Transport Association (IATA); Taleb Rifai, Secretary General of the World Tourism Organization of the United Nations (UNWTO); and David Scowsill, President & CEO of the World Travel and Tourism Council (WTTC). GTAC is currently comprised of the following members: Airports Council International (ACI), Cruise Line International Association (CLIA), International Air Transport Association (IATA), International Civil Aviation Organisation (ICAO), Pacific Asia Travel Association (PATA), World Economic Forum (WEF), World Tourism Organization (UNWTO) and World Travel & Tourism Council (WTTC). 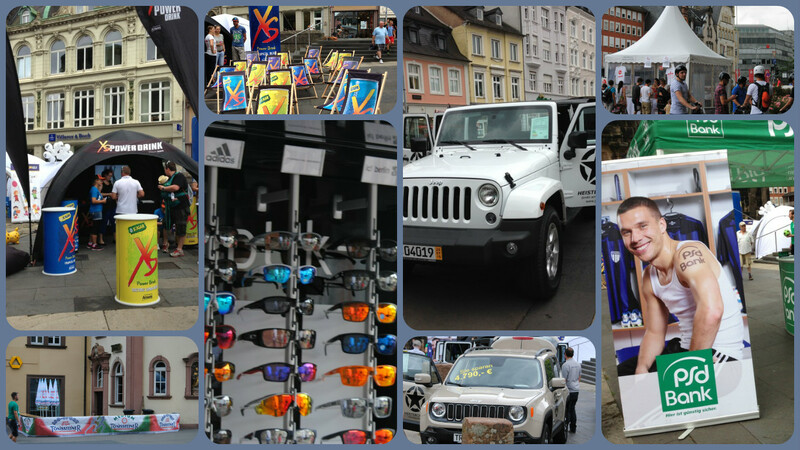 Sunday, July 19, 2015, the historic old German town of Trier was host to the Urbanian Run. 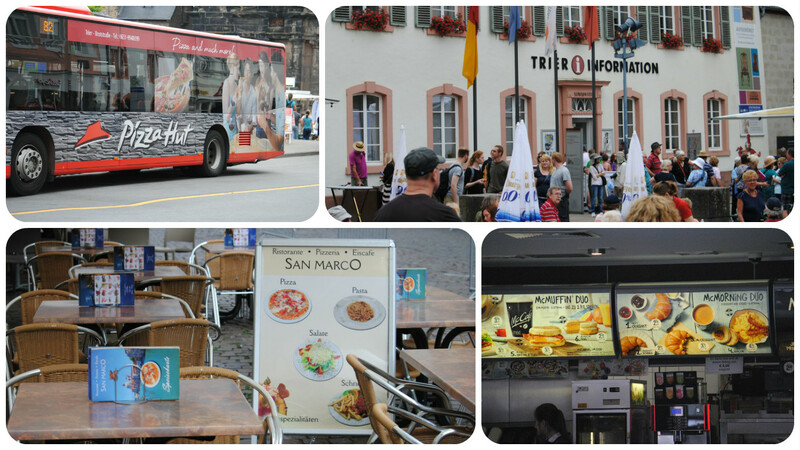 When we arrived at Trier, workers were setting up fences, signs, and advertising along the course. 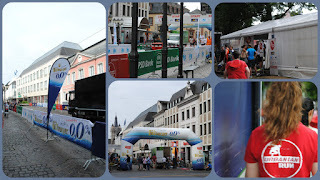 Registration of the runners was also taking place near the Porta Nigra. While the rest of the shops may have been closed due to it being a Sunday morning, there was still plenty of activity at the various race sponsors' booths. Our tour concluded before the 5k & 10k runs began, so we didn't get to witness the event. If you want to learn more, see their website. There's always room for ice cream. You just need to decide how many scoops and what flavors you want. As they say, life is short, so eat dessert first. When returning the ship you could have your main course. 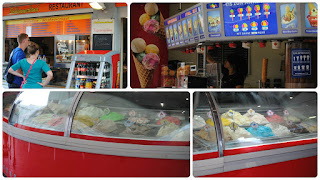 If you want something more than ice cream, you could also checkout some of the local cafes. Select from your favorites back home or one of the local establishments. 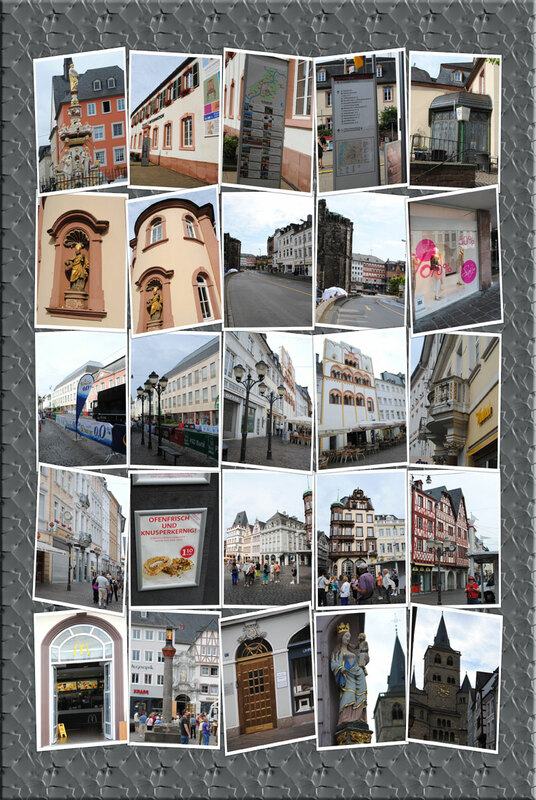 When our free time was over, we all met back at Porta Nigra for the short walk back to our bus. To celebrate National Plan a Cruise Month, CLIA created #CruiseSmile, a daily chance to win a cruise from October 1 through October 31, 2015. Each day, #CruiseSmile will feature and giveaway a different cruise vacation - a total of 31 cruise vacations for two - showcasing there truly is a cruise for every travel style and budget. Contest entries do not roll over from day to day and entrants must upload a new photo each day to be eligible for that day’s prize. The sweepstakes is open to entrants 13 years of age or older. If a minor is selected, a guardian must accept that day’s prize on their behalf. Winners will be selected at random each day in October. 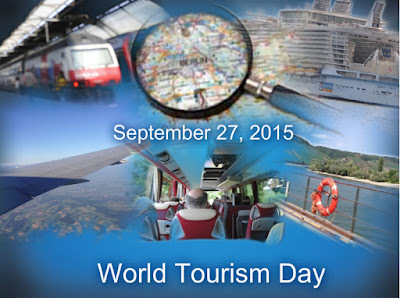 Some blackout dates apply and are to be determined by the cruise lines. 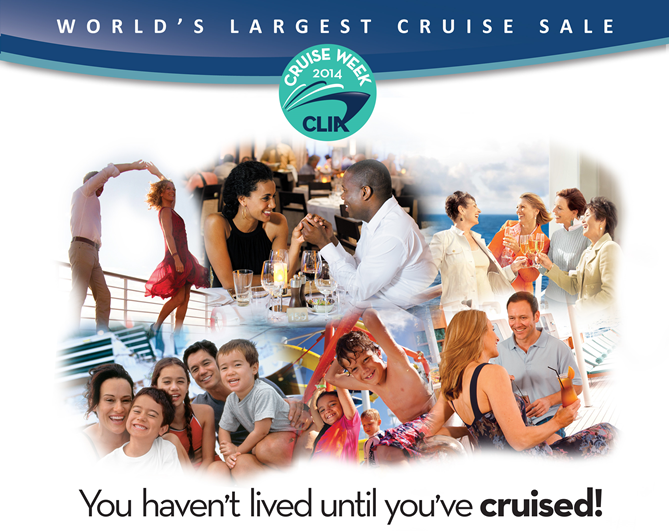 Visit www.CruiseSmile.org for additional details. 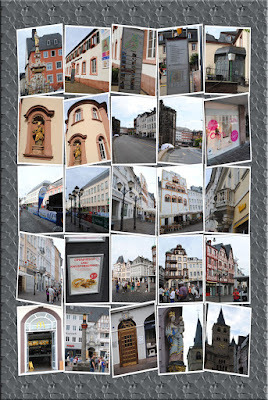 Trier offers pleasant market squares, Germany’s oldest Christian church, and a cornucopia of architectural styles: Roman, baroque, neo-classicism, renaissance, and gothic. 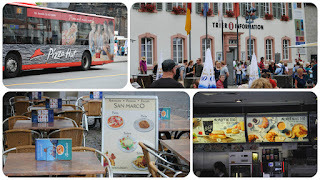 On Sunday the shops in Trier are closed with the exception of some cafes and terraces. A few souvenir stores were open. 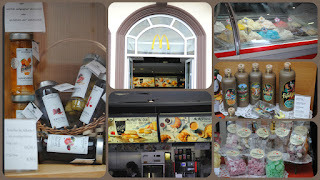 Even though the stores were closed, it was possible to get an idea of what products were available in the shops. Looks like we missed some good sales. The Liebfrauenkirche (Church of Our Dear Lady) is a 13th-century parish church in Trier, separated from Trier cathedral by a narrow passageway. 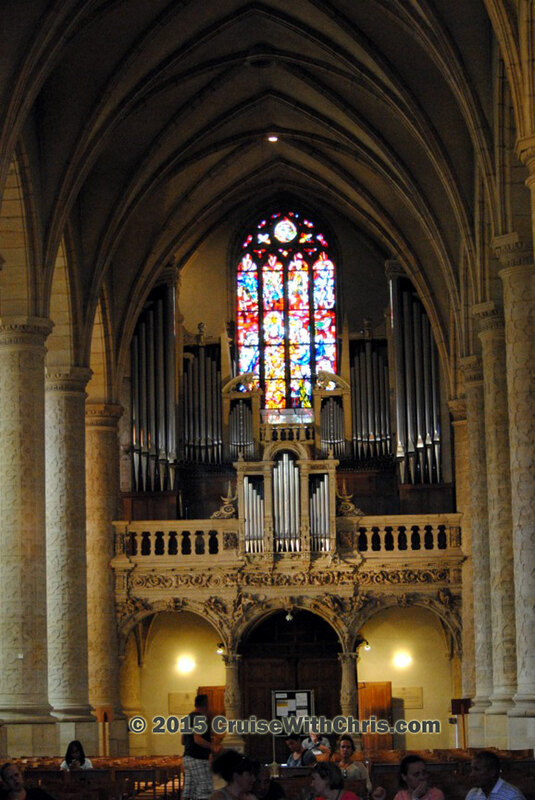 Built in the Gothic style, it makes an attractive foil to its older Romanesque neighbor. We were able to tour the Church of Our Lady but not the Cathedral as a mass was in progress. 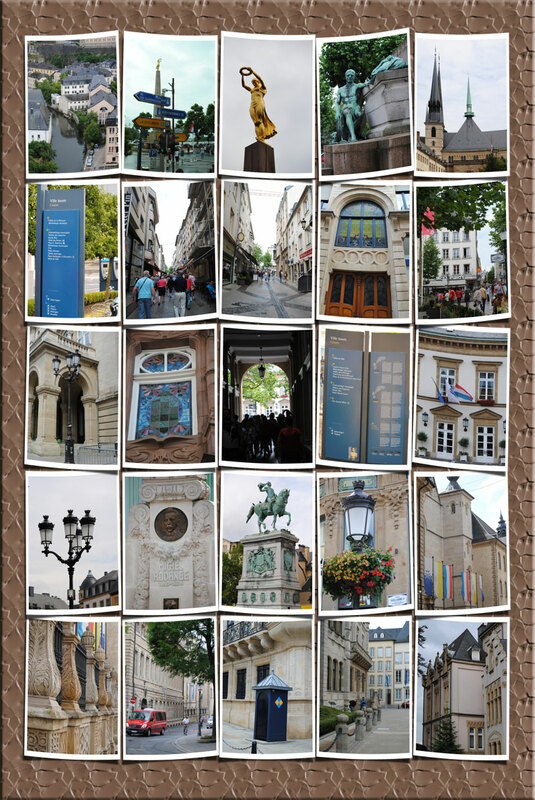 Following the guided portion of the tour we had time to explore the shops that were open or to do some more window shopping. This McDonald's isn't your typical looking restaurant but they do serve some of the same meals from back home. 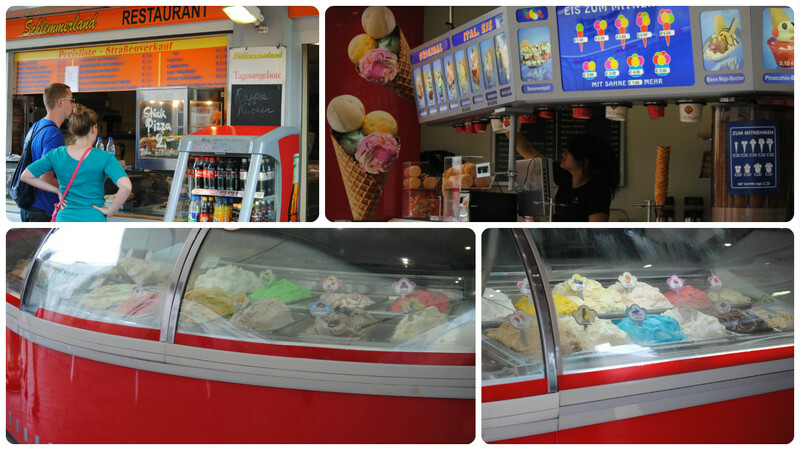 Ice cream and candy are always a good treat, so indulge your sweet tooth if you are so inclined.